The H.8D has the same specs as the H.8, except includes a duplex spring for added flexibility. It is a slim collet type handpiece with pre-lubricated ball bearings that require no maintenance. It has a chuck guard that slides back when changing burs. Comes with 3/32″ (installed) and 1/8″ collets and chuck wrenches for changing collets and accessories. Duplex springs are subject to breakage and are NOT covered by warranty. They are made of special steel, double wound tubular construction with a protective flexible spring cover. We recommend that only experienced users of flex shaft tools consider purchasing this style handpiece. For most users, the “straight” handpiece (H.8) is the preferrable solution. 9-3/8″ long, 5/8″ dia., wt. 5.2 oz. The H.8 is also a slim collet type handpiece with pre-lubricated ball bearings that require no additional lubrication. It has a chuck guard that slides back when changing burs. Comes with 3/32″ and 1/8″ collets and chuck wrenches for changing collets and accessories. 6-1/8″ long, 5/8″ dia., wt. 3.55 oz. The H.44T is a collet type handpiece that accepts accessories with up to 1/4″ diameter shanks. Has pre-lubricated ball bearings that require no additional lubrication. Comes with 3/32″, 1/8″ and 1/4″ collets, pin and wrench for changing collets and accessories. 5-5/8″ long, 1″ dia. (center), 3/4″ dia. (taper), wt. 5.85 oz. The H.44HT is a collet type square drive handpiece that accepts accessories with up to 1/4″ diameter shanks. Has positive locking mechanism (locking ring) for use with Series SRH, TXH, LXH and discontinued H motors and pre-lubricated ball bearings that do not require maintenance. Comes with 3/32″, 1/8″ and 1/4″ (installed) collets, pin and wrench for changing collets and accessories. The H.43T is a shorter version of the H.44T and accepts accessories with up to 1/4″ diameter shanks. Has pre-lubricated ball bearings that require no additional lubrication. Comes with 3/32″, 1/8″ and 1/4″ collets, pin and wrench for changing collets and accessories. 4-1/2″ long, 1″ dia. (center), 3/4″ dia. (taper), wt. 4.9 oz. The H.30H square drive handpiece has a geared 3-jaw #0 chuck with 0-5/32″ (4mm) capacity. Includes chuck key in molded handle. Has positive locking mechanism (locking ring) for use with Series SRH, TXH, LXH and discontinued H motors. The H.30® general purpose handpiece has prelubricated ball bearings that do NOT require any additional lubrication. Comes with HPCK-0 Chuck Key in molded plastic handle for changing accessories. Replacement chuck keys are shown below in related products. 5-3/16″ long, 1″ dia., wt. 5.85 oz. 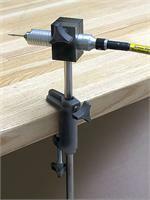 Various bench top tools attach to this versatile handpiece, such as the Foredom Angle Grinder Attachment, Belt Sander Attachment and Handpiece Holder. The H.28H is our newest collet type square drive handpiece that accepts accessories with up to 1/8″ diameter shanks. Unlike Foredom’s other square drive handpieces, this slender model attaches for use with Series SRH, TXH, LXH and discontinued H motors without a positive locking mechanism. Has pre-lubricated ball bearings that do not require maintenance. Comes with 3/32″ (installed) and 1/8″ collets, pin and wrench for changing collets and accessories. 5-5/8″ long, 23/32″ dia. (center), 1/2″ dia. (taper). The H.28 has a slender, comfortable design with tapered grip and pre-lubricated ball bearings that do not require any additional lubrication. 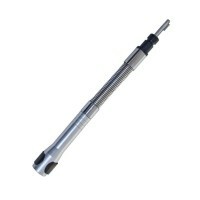 Comes with 3/32″ and 1/8″ collets, and pin and chuck wrench for changing collets and accessories. 5-1/4″ long, 23/32″ dia. (center), 1/2″ dia. (taper), wt. 3 oz. HP775 Duplex Adapter is for use with our standard key tip style shafting and key tip style handpieces. It turns any key tip style handpiece, including the popular H.30® and H.44T, into a duplex spring handpiece for added flexibility when needed. This adapter will turn any of the following standard handpieces into duplex spring models: H.30, H.30-C1, H.30-C2, H.44T, H.43T, H.28, H.8, H.18, H.20, H.52 and H.10. These 6 handpieces already come in duplex models: H.8D, H.10D, H.15D, H.18D, H.20D, and H.52D. Duplex springs and duplex spring adapters are subject to breakage and are NOT covered by warranty. Not for use with H.50 Handpieces or with Foredom Filer, Angle Grinder or Belt Sander Attachments.